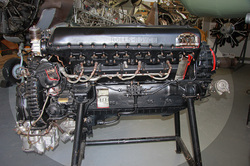 The Rolls-Royce Merlin is a British liquid-cooled, V-12, piston aero engine. Rolls-Royce Limited designed and built the engine which was initially known as the PV-12: the PV-12 became known as the Merlin following the company convention of naming its piston aero engines after birds of prey. The PV-12 first ran in 1933 and, after several modifications, the first production variants were built in 1936. The first operational aircraft to enter service using the Merlin were the Fairey Battle, Hawker Hurricane and Supermarine Spitfire. More Merlins were made for the four-engined Avro Lancaster heavy bomber than for any other aircraft; however, the engine is most closely associated with the Spitfire, starting with the Spitfire's maiden flight in 1936. A series of rapidly applied developments, brought about by wartime needs, markedly improved the engine's performance and durability. Considered a British icon, the Merlin was one of the most successful aircraft engines of the World War II era, and many variants were built by Rolls-Royce in Derby, Crewe and Glasgow, as well as by Ford of Britain at their Trafford Park factory, near Manchester. The Packard V-1650 was a version of the Merlin built in the United States. Production ceased in 1950 after a total of almost 150,000 engines had been delivered.